Chances are that you’re considering having a crown, a number of crowns or a permanent bridge designed. To assure the most esthetic and functional results possible, your cooperation and understanding are especially important to us. In this pamphlet we’ll take you, step by step, through crown and bridge treatment. We encourage you to ask questions along the way. Crown and bridge treatment is a permanent method of replacing missing teeth. A crown is placed on an individual tooth, (somewhat like a thimble over your finger) where there is no longer sufficient tooth structure left to place a filling. Crowns and bridges are most often made from superior materials such as precious metals (gold), semi-precious metals, porcelain, or a combination of metal fused to porcelain. Both esthetics (appearance) and function are considered when selecting the material most suitable for you. All porcelain crowns are used in areas most visible when smiling. This allows for the most lifelike appearance. At the first appointment a thorough oral examination, evaluation of your dental history and necessary X-rays are completed. The diagnosis is based on these three factors. Once it has been determined that crown and bridge treatment is indicated, you will be set up with a series of appointments. Note: It’s important that you keep all of these appointments. You see, your treatment occurs in a planned sequence. Missing or postponing your appointment may cause treatment delays, allowing further tooth movement before treatment can be completed. The tooth or teeth to be treated are numbed with an anesthetic. Sometimes you can expect the side of your face to feel numb, as well. Next, during the preparation phase, your tooth or teeth to be crowned are trimmed down. This allows sufficient space for the crown or bridge to fit. After this preparation stage has been completed, an impression of that area of your mouth is taken. 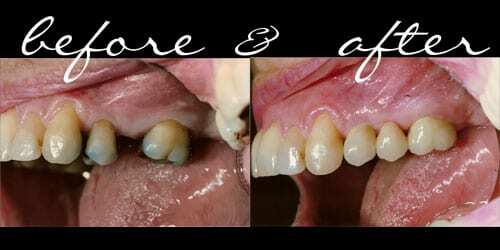 Modern impression materials make it possible to take an extremely accurate record (impression) and thus make the best possible restoration for your mouth. The shade of the crown will be matched to your natural teeth at your first appointment. Tissue compatibility – the contour of the prosthesis must allow the surrounding tissue to conform to a natural, healthy position. Helps keep opposing teeth in their proper place. Helps prevent further dental decay and periodontal (gum) disease. Maximizes your smile, speech and chewing function. Throughout your crown and bridge treatment you may have question or concerns not covered on this page. We will make every effort to ensure your comfort during crown and bridge treatment. And we’re happy to answer any questions you may have. Our concern is your comfort and confidence. Our goal is to help preserve your smile for a lifetime.